Carbonite® is a mined hydrocarbon resin, glossy black asphaltic with a low SG (1.05-1.06). It occurs in very pure states compared to other asphalts and has softening points ranging from 360° to 450°F (180° to 232°C). It is produced specifically as an additive of drilling fluids and for cementing applications in the Oil & Gas industry’s upstream production. Carbonite® is chemically inert, insoluble in water, providing a deformable solid in drilling fluids and cement. It provides formidable technical advantages over other products at a significant reduction in cost. 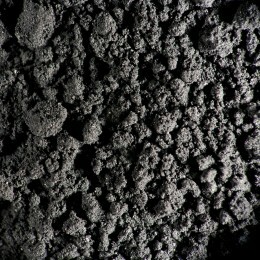 It is a product of HydroCarbonite® SAS in France. Carbonite® is produced with three different chemical formulations suitable for varieties of BHT. It is a high-molecular-weight hydrocarbon resin with a large molecular weight distribution, therefore, its softening point is much higher compared to other types of polymers. This allows molecular deformation to occur gradually as it approaches its softening point, and instead of completely melting into a low-viscosity liquid, Carbonite® remains as a high-viscosity liquid even after 20° above its softening point. The following three distinct product codes are classified in accordance with the start of their softening stage. The process will hold even 20° above the published points. HT / softening point of 205°C or 400°F. Carbonite® is a premium grade SHALE CONTROL additive tested in major MUD labs around the globe, validated for its superior quality and efficiency. Carbonite® is micronized for maximum efficiency with particle size distribution in order to majorly improve Filter Cake Quality as its percent retained particle value on 200 mesh screen is ≤ 5% and on mesh screen 230 is ≤ 10% but, not a single particle remains on 150 mesh screen. Carbonite® is non-toxic, non-carcinogenic, and non-mutagenic. Under the CEFAS system in the North Sea it is rated as “E”, the highest environmental rating. Carbonite® is typically used at 2-6 ppb in a drilling fluid. Carbonite® packaging is in four-ply craft sacks weighing 50 lbs. (22.5 kg). Fifty-five sacks palletized, shrink wrapped and capped on heavy duty plastic pallet serves as standard packaging with no hidden costs. Carbonite® is soluble in aromatic solvents (Benzene, Toluene, and Xylene) and in most chlorinated solvents. Easy well bore clean-up is conducted by circulating out of the hole.